Many marketers feel that creating impressive social campaigns is a Herculean task at low investment. Perhaps they have attempted it over various digital marketing tools; here is how they can attempt to create impressive social campaigns over oval magnets 5X3. All these years, you have always created campaigns, which addressed the question, we are so and so blah, blah, blah. Do you think people would be interested to hear such idiotic stuff anymore? No, never. They always want you to court them with memorable campaigns. For example – Dove is the most popular personal care brand owned by the Unilever, which excels in toiletries. They have always harped on their famous byline –“Only Dove is one-quarter moisturizing cream.” Although advertising themes have changed over the years, but every advertisement revolves around this memorable byline. People love to see humorous campaigns and they would absolutely remember funny campaigns for a long time. You can try to make your brand information sound humorous and entertaining at the same without disturbing the sanity of the product. Employ full color oval 5X3 magnets printed with humorous lines for promoting your product or service during the next available opportunity. You can seek inspiration from the famous Jingle Bellies commercial by the Kmart. Make your campaign sound more human and less robotic. You do not need to hit it with direct selling prepositions; rather, make it sound very friendly. Avoid using words that you have been regularly using for promoting your products. Position your advertisements as if you are talking to a human being. For example – Starbucks came up with their new product Pumpkin Spice Latte during the Holiday season. They piqued interests by Tweeting “I saw you with that #SaltedCaramelMocha yesterday. #WeNeedToTalk.” Doesn’t that sound impressive? Similarly, you can make your campaigns stand up as a human rather than a lifeless object. Moreover, you can use the large surface area over 5×3 oval magnets to build campaigns that talk like human, act like a human and inspire like a human. 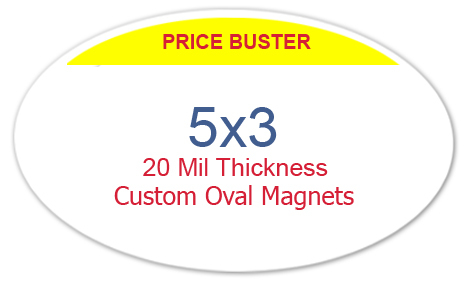 Now, you may ask, if you I have to create an advertisement, which spells surprise and generates delight, is it possible to achieve it over customized oval magnets 5×3? Yes, it is definitely possible only you need to plan campaigns that trigger customer interests. We are sure that like everyone else, you believed that people were only interested in savings. No wonder, you have been marketing it as Discounts, Up to 25% Savings, FreeMembership, etc. Have you ever tried to create an element of delight or offer bagful of surprises? If not you should try one over these large sized oval magnets. We have only tried to cover a handful of emotions that you can express through your campaigns. Perhaps with magnet advertising, there is always a big room for experimentation. By purchasing these customized magnets from any reputed online eCommerce store stocking only made in USA magnets, you can save on online design proof, art setup, shipping and full color printing because their prices are included within the product price.